The December 2015 issue of Tabletalk considers contentment. The Bible emphasizes that Christians should be content in Christ. 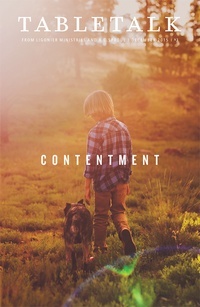 On the one hand, contentment means resting in the peace of Christ. On the other hand, it doesn’t mean that Christians should simply be satisfied with everything all of the time. Rather, biblical contentment involves pursuing excellence and God’s will for our lives, knowing that we will only reach ultimate contentment in the new heavens and new earth. Thus, the biblical call to contentment is a multifaceted subject. This issue of Tabletalk explores these ideas and others related to contentment. Contributors include R.C. Sproul along with Tim Challies, Jon Payne, Melissa Kruger, Sinclair Ferguson, Jay Bauman, Steven Lawson, Les Newsom, John Blanchard, and Danny Wuerffel.